2nd Round - ch3, 1dc in base of ch3, 2dc in each dc to end, sl st to 3rd of ch3. 6th Row - ch3, 1dc in each dc to end, sl st to top of ch3 on beginning of round. Rpt 6th row once. Fasten off. Join in contrast color and rpt 6th row three more times Fasten off. Rejoin main color and rpt 6th row twice, you should have worked 12 rounds in all. 1dc, 1dc in next dc, skip 1dc, 2dc in last dc, sl st to top of ch3 on beginning of round. on centre row of contrast color above brim, decorate with rosebud. 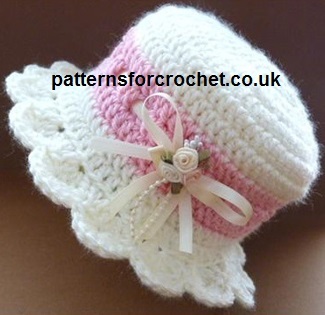 Hope you enjoy this free crochet pattern for a brimmed baby hat.